Four amazing DJ acts for a fantastic February, that is what Zouk Genting has lined up for partygoers next month! 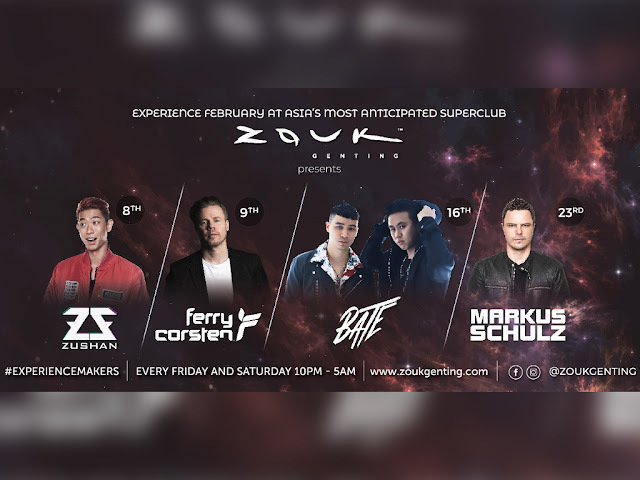 Kicking off the party from 10pm to 5am on 8 February is Zouk Singapore’s Resident DJ Zushan, followed by Dutch DJ Ferry Corsten on the same time the next day. Malaysia DJ Duo BATE steps up the following week and German-American DJ Markus Schulz wraps it the week after, both also from 10pm to 5am. Tickets for the parties are priced at RM65 each, inclusive of one drink. Reservations can be made over the phone (+6019-390 3738) or visit www.zoukgenting.com for more info. Partygoers will get to party away to DJ Zushan’s skilfull mix of House, Techno, Funk, Disco, Dubstep, Drum & Bass; Ferry Corsten’s trance-infused soundscapes, BATE’s banging tunes and 2018 single “One I Love”; and Markus Schulz’ distinctive beats. “This amazing line-up of international DJ stars in February is just a preview of what Zouk Genting has in store for Malaysians and party-goers around the region,” says Joseph Ryan, Project Director of Zouk Genting, in a press statement. Located on Level G, SkyAvenue, Resorts World Genting, Zouk Genting opened in November last year and is comprised of the Zouk Genting main stage, hip-hop club Empire by Zouk, gaming bar Redtail by Zouk, Redtail Karaoke and upcoming vibe dining restaurant FUHU Restaurant & Bar.